Dutch symphonic metallers DELAIN plan to celebrate their 10th anniversary with a special show in Amsterdam on December 10th that will also be recorded and filmed for a release on CD and DVD. The band states: “Happy Birthday to…US! Dear Delainers, as many of you know, 2016 marks a very important milestone for DELAIN: our tenth anniversary in music! In September 2006, we released our debut record, Lucidity, and YOUR overwhelming response to our first record made us turn DELAIN: The Project into DELAIN: The Band. That was 10 years ago, and today, we find ourselves looking back at a decade of rocking stages all over the world. Four albums, two EPs, and ten years later, we feel that we need to celebrate this milestone properly…with you! 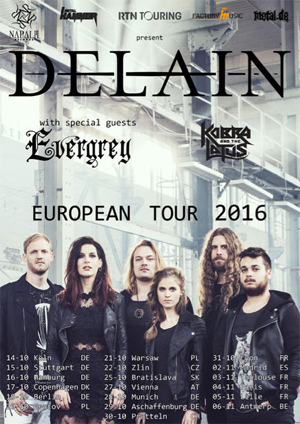 DELAIN also recently announced a fall European tour, the dates for which you can see below. Since the release of their album The Human Contradiction in 2014 on Napalm Records, DELAIN have been constantly touring all over the world and shared the stages with arena acts such as NIGHTWISH, WITHIN TEMPTATION and SABATON. DELAIN ended 2015 headlining and conquering stages in sold out venues all over the world. In between heavily touring, DELAIN found the time to release a new EP titled Lunar Prelude (February 2016, Napalm Records), which includes two brand new tracks, exciting live cuts, mastered by Grammy Award winning Ted Jensen, Lunar Prelude leaves the listener with a hunger for more, but shortens the wait for the next full length album from DELAIN which is set for release Summer 2016. DELAIN are going to hit the road this fall in support of the new album for an extensive European tour. Make sure to catch the band and their energetic live shows on the following dates with special guests EVERGREY and support from KOBRA AND THE LOTUS.